Pour water and milk into a saucepan, add the butter, cut into small cubes, salt and sugar. Sift the flour into a separate bowl. Beat eggs with a fork and drain. Put the pan on a high heat and bring the liquid to a boil (while stirring) until the butter dissolves completely. Remove from heat, add flour and mix well. Stir until it turns into a smooth uniform mass. Return the saucepan to the heat, and make the resulting dough thicker (stirring) until it gathers into a “dough ball” (about a minute). Transfer to a mixing bowl (of a mixer) with paddle guitar and mix on medium speed, gradually adding the eggs. The resulting dough will be a paste-like mass. Put the dough into a pastry bag with a 12mm nozzle . On a sheet of baking paper draw a circle with a diameter of 22 cm (and then flip it over). Squeeze the first ring of dough on the inner rim of the circle. Add another ring, adjacent to it from inside. !!! Put the first ring inside the circle inside the first – put the second ring. Midway between the rings lay third ring “second tier.” Sprinkle with chopped pistachios and sugar. Heat the oven to 260C. Put in the rings in the oven, close it and turn off the heat for 15 minutes. Turn the oven to 160C and bake for another 20-25 minutes, until the rings become brownish. When the ring is ready, sprinkle it with sugar powder and let it cool. Heat the pistachios for 2 minutes in a heavy-bottomed pan over a high heat and then transfer them into a bowl. “Pour” the cardamon into the same bowl and heat for 30 seconds, until the typical smell/aroma appears. Add the sugar to the bowl and melt it over high heat. When melting the sugar, please note that the pan needs to be removed from the heat from time to time and rotated (the semi-melted sugar should move on the pan) to avoid getting a burnt caramel. When the resulting caramel reaches a light amber color, add the pistachios, mix with the liquid and then remove from the heat. Cool the pistachios on a sheet of baking paper. Take the praline, “break” it into small piece and grind (in a mixer) into crumbs. Grind the cookies and the zest into crumbs. Melt the chocolate on bain marie (or in a microwave). If melting in a microwave, keep in mind that the chocolate brick can retain its form even in when melted. It’d be better to use the microwave in short cycles of 30 seconds each, and check the condition of the chocolate after each cycle. Mix the chocolate, cookies and praline crumbs into wet dough lumps. Spread the mass on a sheet of baking paper , cover with another sheet and roll into a thin layer. Put in a refrigerator to cool. 1 banana – 180 gr. In a heavy-bottomed pan, cook the caramel – exactly like specified above in the praline section. Add the butter to the finished caramel and stir well until the mixture is homogeneous. Cut the bananas into quarters lengthwise and then into thin slices crosswise. Add to the caramel and cook, stirring, over medium heat for 2 minutes. Add vanilla, stir and remove from heat. Allow to cool down. Pick the thyme leaves from the branches, put in a bowl and pour half of the cream over them (140 gr.). Leave overnight in a refrigerator to have a thyme taste “infusion”. Melt the chocolate in a bain-marie (or in a microwave). Take the thyme-infused cream, drain them and bring to boiling. Pour in the hot cream into a melted chocolate and mix until getting a uniform mass. 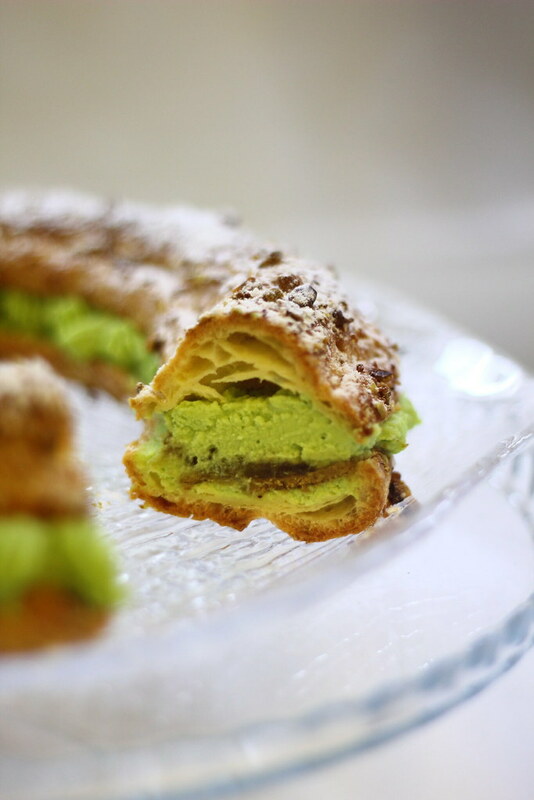 Pour in the remaining 140 grams of cream and add the pistachio paste. Mix into a uniform mass. Cover the resulting ganache with a food wrap (it needs to touch the surface of the ganache) and let it cool in the refrigerator for, at least, 3 hours. Move the ganache to the mixer bowl, with a bell-shaped whisk “attachment” and beat at a low speed. When the ganache becomes more dense (but still remains a liquid), add the Mascarpone cheese (do not stop the mixer rotation). Be very careful, this type cream has high percentage of fat, and it is very easy to “over beat” it. You need to process it till the condition when the tip of the cream on an inverted beater would not stay “straight”, but would slope towards the bottom. Move the cream to a pastry bag with a wide nozzle (12 mm is what I had) and deposit the cream on the cake. Cut the choux pastry ring into upper and lower halves. Place a thin layer of the cream on a lower half and make it smooth with a spatula. 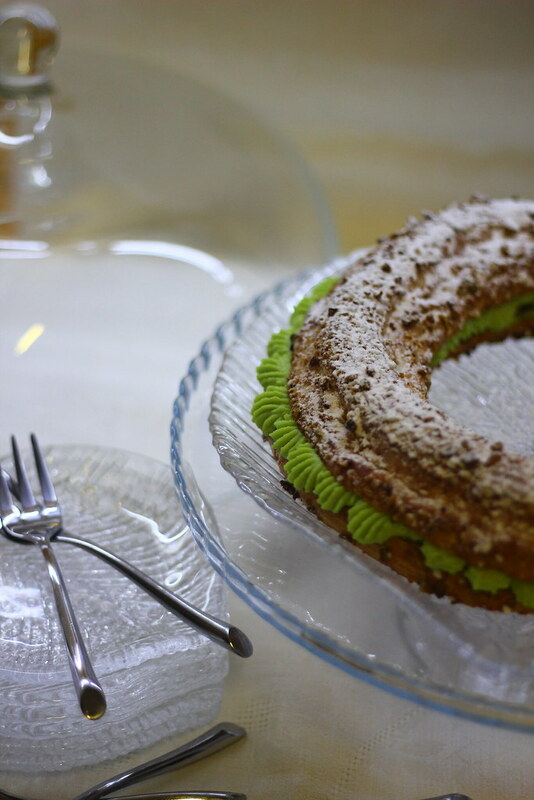 Cut a ring out of a praline layer (diameter – 21 cms)). 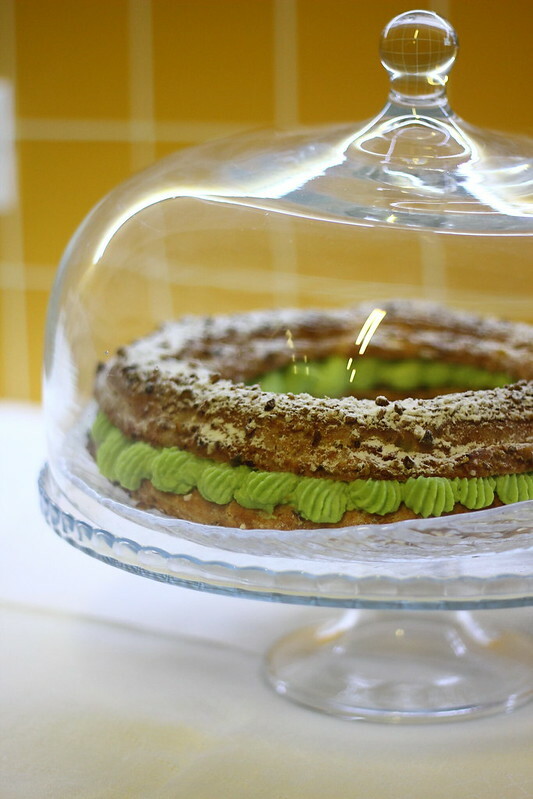 Make sure that the praline ring is slightly narrower than the choux pastry one. 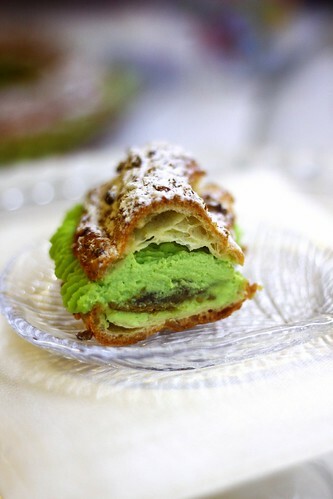 Place it on the cream-covered lower half of the pastry. On top of the praline ring, spread a thin layer of banana caramel. On top of the caramel, spread the cream (as you can see, I did it using a pastry bag) and cover it with the upper part of the original choux pastry right. Leave in a refrigerator for an hour.